That's 562 lbs. of food ready to go to the Mercer Street Friends Food Bank. From left are: Erik Munguia, Jared Rogers, Wesley Gramajo Reyes, Joao Cadima, Talys Drumond, Cassie Filipowicz, Daja Dupree, Shanice Barnes, Mary Kate Madonia, Tomas Barbosa, Kelly Greenewald and Sage Southard. Sorting food for distribution was part of the asisgnment for the food bank volunteers. A job well done to benefit the less fortunate in the county. 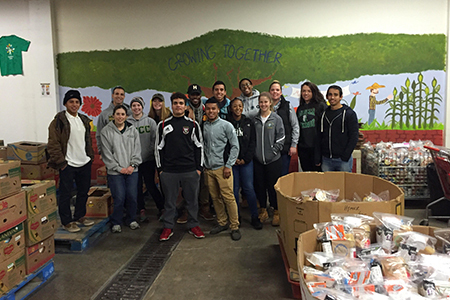 West Windsor, N.J. – The Mercer County Community College (MCCC) Athletics Department did its part this holiday season to fight hunger in Mercer County. Following a month-long food drive that began in November, a group of student athletes and staff members piled cans, boxes and bags of food – totaling 562 pounds! – into college vans for transport to the Mercer Street Friends (MSF) Food Bank in Ewing on Dec. 14. Athletes from the women’s basketball, men’s soccer and women’s cross country teams, along with three staff members, spent several hours at the Food Bank sorting out food items and preparing them for distribution. Donations came from athletes and other students, as well as staff and fans who attended home basketball games. Brian Peterson, community resource liaison for the MSF Food Bank, got into the action, setting up a display in the Physical Education building lobby during the games and speaking at halftime about the organization’s mission, which is to provide food to more than 60 charitable groups including soup kitchens, shelters and food pantries throughout the county. According to Athletics Department Administrative Assistant Erin Cahill-Wetzel, who helped organize the food drive and the Dec. 14 outing, the food bank project was rewarding for one and all, especially those who were able to travel to the MSF distribution center. “It was hard work but a lot of fun. It was great to see the teamwork of our athletes off the playing field, as we sorted through food and organized boxes. We also got a tour of the facility, where we learned more about where the donated food comes from and where it goes. We all came to realize the great need among vulnerable populations here in the county and around the state,” she said. 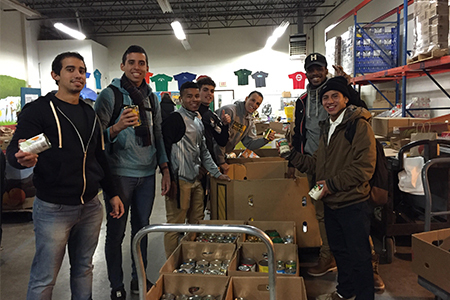 Athletes who volunteered at the food bank included Tomas Barbosa, Joao Cadima, Talys Drumond, Wesley Gramajo Reyes, Erik Munguia and Jared Rogers (men’s soccer); Shanice Barnes, Daja Dupree, Cassie Filipowicz and Mary Kate Madonia (women’s basketball); and Kelly Greenewald and Sage Southard (women’s cross country). Along with Cahill-Wetzel, Mike DeAngelis, head coach for cross country, and Jane Berlinger, assistant coach for women’s basketball, also participated. 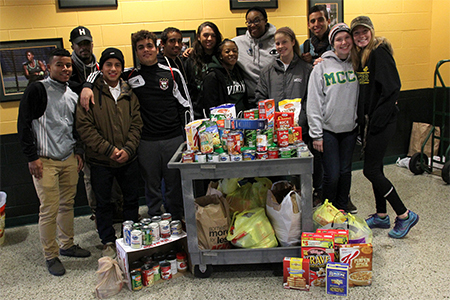 MCCC is a member of the Garden State Athletic Conference, which encouraged all of its member institutions to organize charity food drives this holiday season. The Vikings clearly stepped up to the challenge. “It was a true winning effort by our students on behalf of the less fortunate,” Cahill-Wetzel said.